Aubrie turned 11 years old in November 2008. She is a delightful girl with an exceptional sense of justice and love. She adores all things Broadway. Her favourite composers are Andrew Lloyd Weber and Irving Berlin. From infancy, Aubrie has loved music and books. She would flip through anything with pages: books, catelogs, phone books, TV guides. Now she is an avid reader who enjoys the Little House series by Laura Ingalls Wilder, the Junie B. Jones series by Barbara Parks, and the Ramona series by Beverly Cleary. She listens to music constantly: for fun, relaxation, stressrelease and to fall asleep. Her favourite TV station is the Sirius satellite radio Broadway station. This year, she joined the school band on percussion and performed in her first Christmas concert. She attends our local school in a regular 5 th grade classroom with a 1:1 aide and support from a special education learning specialist, PT, OT, ST, and hearing and vision specialists. This year, she has a CCTV and a laptop in addition to largeprint books and an FM system. Technology has been wonderful for her! She enjoys many friendships at school although this year she is becoming aware of her differences. Her birthday party this year was a Willy Wonka party (complete with big brother, Andrew age 17, playing the part of Wonka!). Eight school friends redeemed their Golden Tickets to join us in celebrating her special day. Aubrie is becoming a competent selfadvocate. In 2007, she participated in a disability rights rally at the state capitol. To the legislators, she presented a brochure sharing her dream for a future in the community for all people with disabilities – rather than the institutional care that is still common in Illinois. She is fascinated with Martin Luther King, Jr. and hopes that our new President Obama will bring about positive change for people with disabilities. Aubrie has come a long way from the newborn that seemed so sick we wondered if she’d ever come home with us. Aubrie was born fullterm after a complicated pregnancy and delivery. I remember crying alone in my hospital room listening to her cry in the nursery as they placed an IV in her newborn scalp. Those are not the memories we want to associate with the first hours of life. Aubrie spent her first 3 weeks in the hospital after having thoracic heart surgery to repair a coarctation of the aorta. She was home a short time before being readmitted to spend her first Christmas in the hospital for failure to thrive. She was tubefed until age 1.5 years. She’s had numerous surgeries and procedures over the years for many things including: tear duct blockage, glaucoma, strabismus, hip reconstruction, submucous cleft palate repair, external ear reconstruction, middle ear reconstruction, and BAHA (boneanchored hearing aid). Unfortunately, doctors and hospitals have become a “normal” part of her life. She’s gradually come to realize that other babies and children don’t usually have surgery. She has worn glasses since she was about 2 years old and got her first hearing aids at age 3. Each time she has had an improvement in hearing (either from new aids, healed ear infections, or ear surgery), her speech has improved dramatically. Her speech still can be difficult for an outsider to understand, but most people who know her can understand her. Speech therapy continues to help her learn to make the sounds that are challenging. Aubrie can eat anything and enjoys food very much. 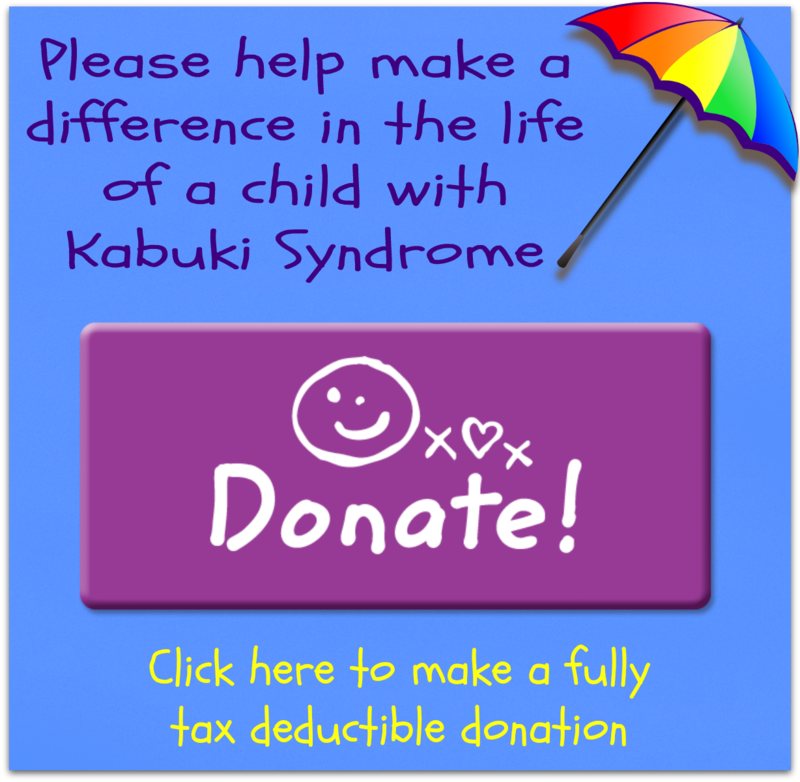 She runs, dances, plays, and enjoys life in spite of the limitations that Kabuki sometimes puts on her. In infancy, Aubrie was diagnosed with CHARGE syndrome. After many years of involvement with a worldwide CHARGE ‘family’, her diagnosis was changed to Kabuki in the summer of 2007. In her own words, Aubrie says, “I don’t want teasing and that’s why I don’t like to feel different. I don’t get teased now, but I’m afraid I might. Even though I have Kabuki, I can figure out how to do stuff that other kids do. Whenever we are playing soccer and the ball is coming close to me, someone else usually has it because it’s hard for me to see it. When I grow up, I’d like to be an actress on Broadway. I’d have to live in New York on my own because my mom and dad live in Illinois."